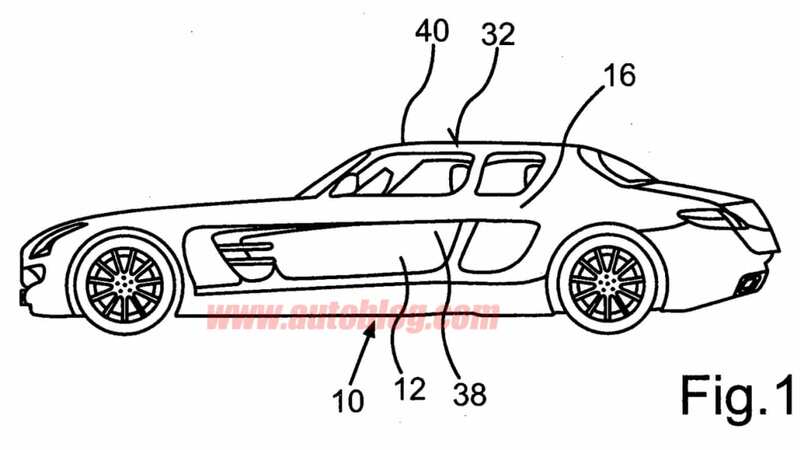 Four-door Mercedes-Benz SLS AMG suggested by patent filings? Perhaps more than most, Mercedes-Benz has proven to be remarkably adept at platform sharing, pulling and pushing at their various architectures to create new models. Take, for example, the marque's E-Class range, which in addition to sedan, coupe, convertible and wagon variants, spawned the CLS 'four-door coupe' – a model that itself inspired a whole slew of imitators. The rakish CLS will shortly spawn a load-lugging shooting-brake variant, too – Benz's offspring are having offspring. 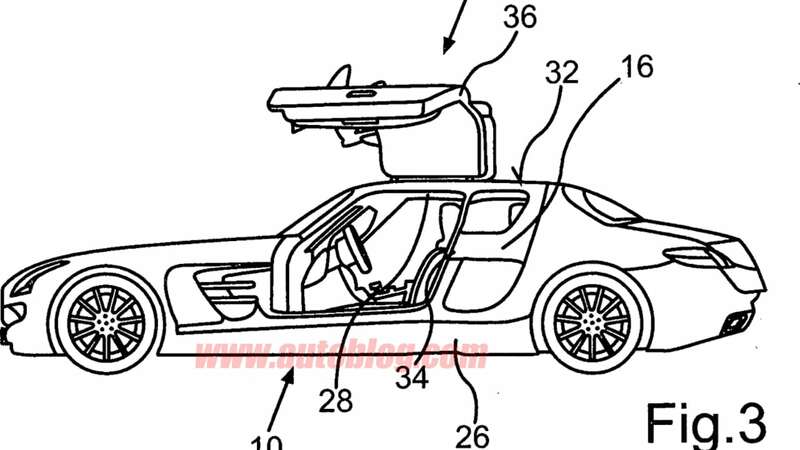 Could the same thing be in the cards for the SLS AMG? 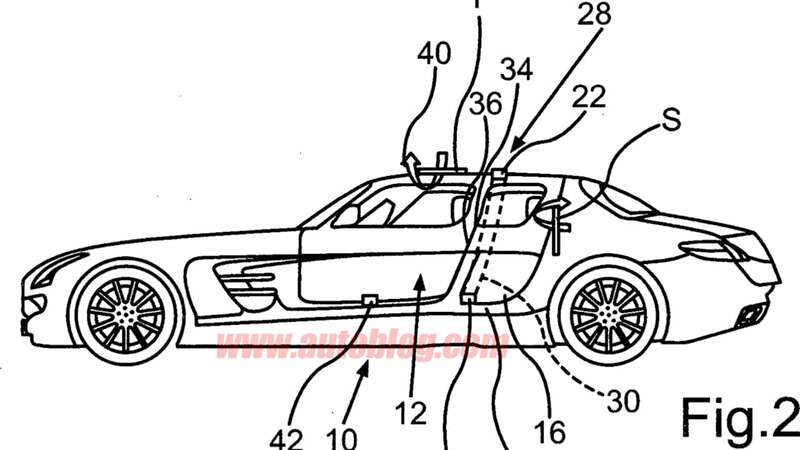 Mercedes has already extended the supercar's appeal with a new Roadster variant for 2012, but as Autoblog can exclusively reveal, an alleged German patent filing suggests that the SLS may be in for an unexpected third bodystyle – that of an unconventional four-door. 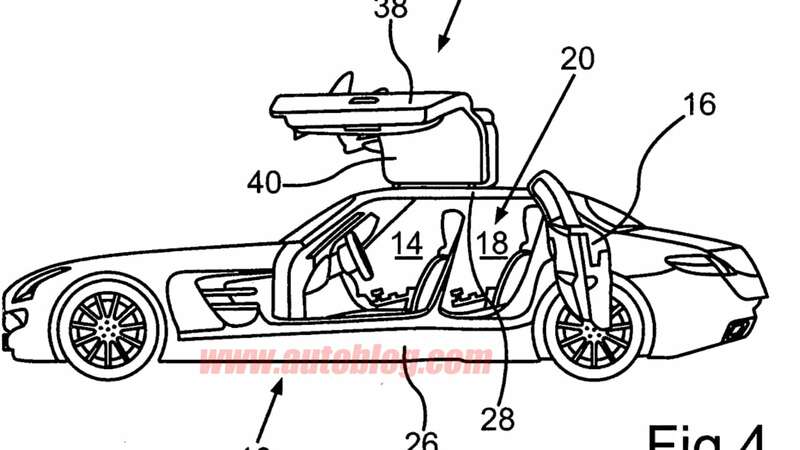 As shown here, Mercedes appears to be considering a set of rear-hinged demi doors to go along with the vertically sweeping main gullwing doors that would give access to a small back seat. 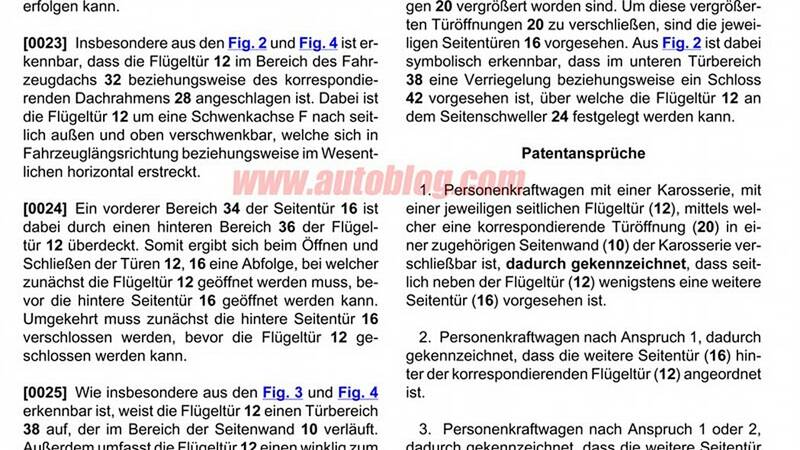 In typical patent-ese, the paperwork suggests that the automaker is particularly concerned about minimizing weight gain and preserving structural rigidity, though it appears there is no fixed B-pillar present. 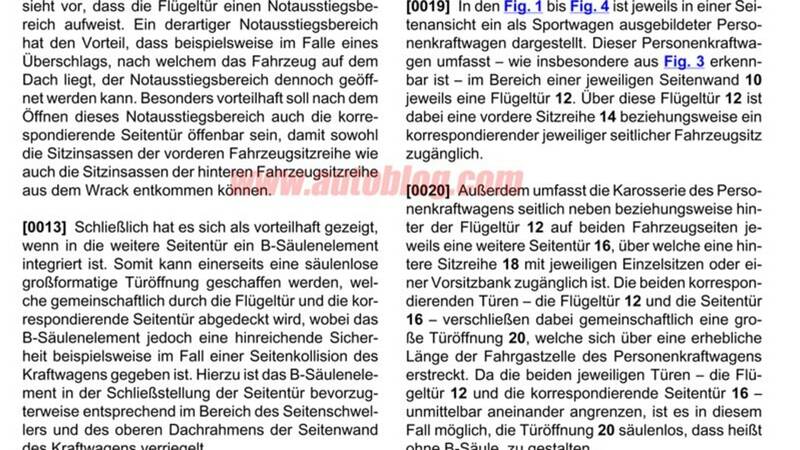 It isn't immediately clear if these alleged Deutsches Patent- und Markenamt documents are indicative of a production model, a show circuit-only concept, or just a bit of ambitious blue-sky designer thinking. 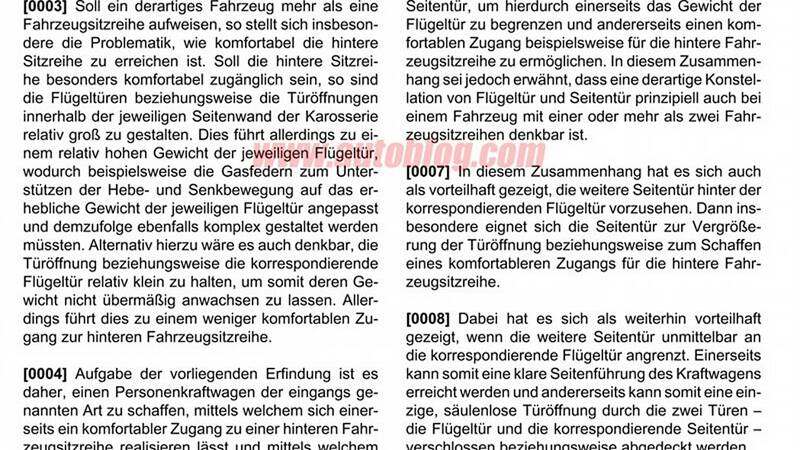 For its part, when shown these documents and asked for comment, Mercedes-Benz officials wouldn't say anything beyond the standard "We won't take the liberty of sharing comments for any potential future products."  We specifically asked if they would like to deny the materials, and they declined. The paperwork shown here doesn't give away much else, certainly not touching upon whether any modifications would be made to the SLS' 571-horsepower 6.2-liter V8 or its rear-drive power delivery. The drawings accompanying the filing clearly suggest an extended wheelbase to accommodate the extra doors, as well as what looks like a second COMAND multi-function control knob on the console between the seats, but that could just be a bit of artistic license or perhaps some lazy cut/paste work in Photoshop duplicating the front seats. Presumably, if a four-door SLS AMG were to come to market, it would likely come at a premium price for the extra engineering – the coupe model starts at $192,175 delivered, so we'd wager that the pricing would start with a "2" at the front, putting it in the hunt with cars like the Aston Martin Rapide and perhaps the Porsche Panamera Turbo. Tip: Thanks for the tip, Mysterious!